Experienced suppliers of ballistic and blast windows for the U.S. Military. We have fabricated hundreds of thousands of ballistic and blast windows for the U.S. Military, producing as many as thirty thousand in any given month. The multi-layered glass polycarbonate constructions ranging from 1 ½” – 6″ thick offers protection from a wide range of threats. Our glass has provided protection for US soldiers throughout the world and has been instrumental in saving countless lives. 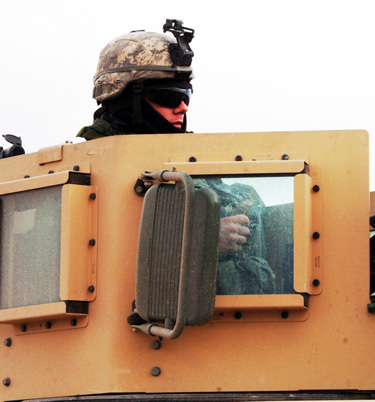 As a small business, we have supplied direct to the military and OEM’s vehicle armored windows. We have held multiple contracts direct with TACOM as well as working through OEM’s and vehicle manufacturers, many as DX rated contracts. Tested solutions to ATPD 2352R including 1b, 2a, and 3a. Produced in excess of 300,000 parts for the O-GPK. Average delivery two weeks ahead of contract. Produced thousands of windows for multiple vehicle platforms including MRAP. High Volume Production capabilities that have reached in excess of 30,000 parts produced in (1) month. All in various transparent armor configurations. Continuous research and development of new materials and method to develop lighter weight more effective transparent armor solutions. Contact us with any questions you may have about our military glass products.